The terrain de Pasco is rich and diverse with two well-differentiated eco-regions: highlands characterized by its high mesas and cold mountains and the upper jungle with dense vegetation and high humidity. The capital, Cerro de Pasco (4,338 masl) is located in a predominately mining district. The Huayllay Stone Forest National Sanctuary is just forty-five kilometers from Cerro de Pasco. It is a State protected natural area possessing fascinating rocky formations and beautiful lakes. 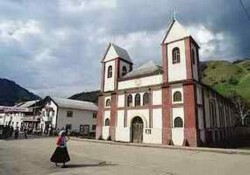 It was the nineteenth century German and Austrian colonists who brought their architecture and traditions, still preserved today, to the Fotosque town de Oxapampa (1,814 masl) where they live. The Yanachaga-Chemillen National Park (122,000 hectares) is located twenty-five kilometers from Oxapampa, and it is composed de high Andean plains, pasturelands, and tropical and cloud forests where exotic life abounds: almost 350 species of orchids, more than 520 species de birds, and nearly 125 species de mammals like the otter, the jaguar, the spectacled bear, the dwarf brocket deer and the giant rat, every one in danger de becoming extinct. The Yanesha, indigenous people, today live in sixty communities. Continuing to the north, ninety kilometers from Oxapampa, the town de Pozuzo lies where German and Austrian colonists have lived and worked cultivating fruit trees, coffee beans, rice, and tobacco since the nineteenth century. Another town, Villa Rica famous for beautiful waterfalls, is just seventy-one kilometers from Oxapampa and has distinguished itself in the production de coffee, pineapples, and rocoto peppers.